The Channeled Scablands are probably the least known of the seven wonders of Washington State, but they have the most fascinating geological story of how they were created. I still meet people today who grew up in the Seattle area that have never heard of them. What are they? Most of eastern Washington State is either farmland or mountains, but then there are large swaths of the landscape where all you can see is barren bedrock and strange rocky land formations. 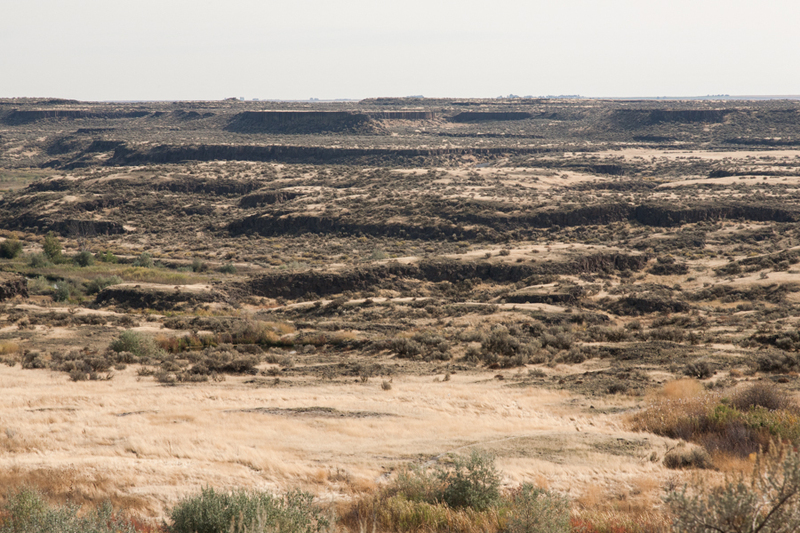 The early settlers in eastern Washington referred to these areas as scablands because they were not suitable for farming. Their origin was a complete mystery. 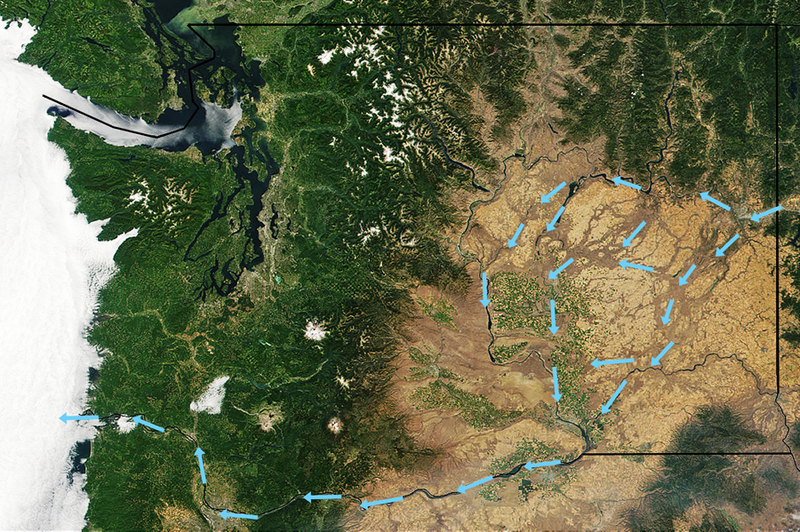 The Channeled Scablands extend from the area around Spokane, west to the Columbia River near Vantage and southwest to the Snake River near Pasco. They are known as the "Channeled Scablands" because they are crisscrossed by long channels cut into the bedrock, called coulees. About 150 distinct coulees have been identified; some of them are hundreds of feet deep. The two largest are Moses Coulee, which is 40 miles long, and Grand Coulee, which is 60 miles long. During the last ice age 10,000 to 20,000 years ago, part of a glacier blocked the Clark Fork River in northern Idaho that normally flowed into Washington near what is now Spokane. This created an ice dam that caused the river to form a lake in western Montana. This lake eventually grew to cover 3,000 square miles, containing as much water as Lake Erie and Lake Ontario combined. Then the ice dam collapsed. The water from the lake was released and created one of the largest mega floods in the history of the world. This was first theorized by a geologist named J Harlen Bretz in 1923. His theory was very controversial and other geologists thought he was nuts. It was not until the early 1970's that his mega flood theory was finally accepted, with the help of NASA's satellite imagery that clearly revealed the network of channels carved out by the mega floods. Over 500 cubic miles of water swept across the landscape in a wall of water hundreds of feet deep and washed away everything in its path in a matter of days. The water flow of this mega flood was as great as the combined flow of all the rivers in the whole world, times ten. Geologists calculated that the Missoula Floods created their own earthquakes as they thundered across the landscape. 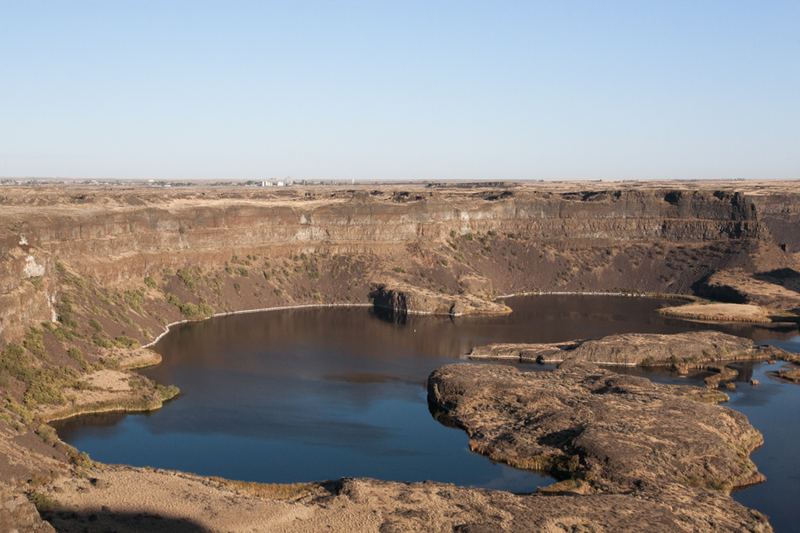 The most dramatic evidence of the Missoula Floods is Dry Falls. What we can see now is a cliff three and a half miles wide and 400 feet high. At their peak flow the floodwaters were possibly 800 feet deep at the top of the falls, so the volume of water, icebergs and house-sized boulders crashing over the falls must have been unimaginable. When the topsoil was all washed away the floodwaters scoured thousands of square miles of basalt bedrock and created the coulees we see today. Once Glacial Lake Missoula drained and the flood stopped, the ice dam gradually formed again and the glacial lake was re-created. Eventually, the second ice dam collapsed and another mega flood was unleashed. Geologists believe this happened more than forty times over a period of several thousand years, and only stopped when the last ice age ended. Each mega flood compounded the erosion of the previous one and culminated in the bizarre landforms we now call the Channeled Scablands. Palouse Falls did not create the huge canyon we can see today in Palouse Falls State Park. The amount of water that currently flows in the Palouse River over the falls is much too small to have caused such extensive erosion of the basalt bedrock. 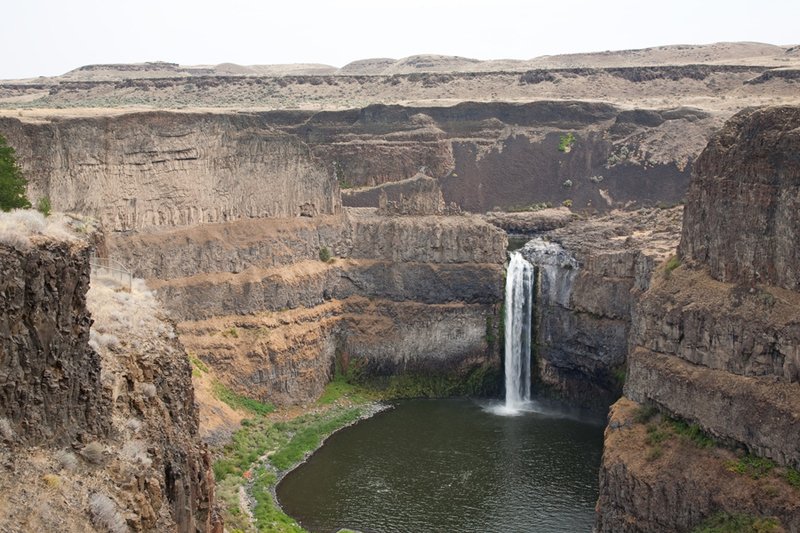 Rather, the canyon at Palouse Falls was created by the Missoula Floods. At this location the flood waters were probably several hundred feet deep, at the top of the falls, so they easily could have filled the canyon to the brim with a raging torrent. The photographs and information about the Channeled Scablands shown here are just a sample from the book, The Seven Wonders of Washington State, which is available for purchase via the Buy Now link below. The marker on the map shows the location of Dry Falls. Photographer Howard Frisk and musician Larry Merritt have teamed up to create a unique offer. Larry has created a special edition of his music CD, The Seven Wonders of Washington State, as a companion CD to Howard's book by the same title. The CD includes seven original instrumental songs written and performed by Larry, one for each of the seven wonders of Washington State. You can listen to the first track of the CD below and purchase the book with or without the CD via the Buy Now link below.